LEEUWARDEN, The Netherlands --- A large-scale public relations effort organized jointly by the Royal Netherlands Air Force and Lockheed Martin to persuade Dutch public opinion to accept the F-35 Joint Strike Fighter proved something of an overkill, as initial noise measurements show the F-35 is only marginally noisier than the F-16 it is due to replace. This defused much of the opposition from local residents, who feared the F-35’s noise would be much higher and so prove much more of a nuisance. It was to allay these fears that Dutch Defense Minister Jeanine Hennis-Plasschaert promised to bring the aircraft to the Netherlands to test their real noise levels. This writer experienced a single F-35 take-off on May 30, when the aircraft followed two F-16s, and the general impression was as described by residents: the F-35 generates more noise and more vibrations, but is less bothersome because of its lower pitch. A second flight scheduled for May 31 was cancelled for maintenance reasons, Dutch Air Force spokesman Lt Col Sidney Plankman said, so this initial impression could not be confirmed. By June 1, one F-35 (s/n F-002) had flown 8 sorties on noise measurement and perception missions since arriving in the Netherlands on May 23, Col Albert de Smit, an F-35 pilot and head of the detachment, told reporters May 31. The second F-35 (s/n F-001) was scheduled to fly on June 1, after spending a week in ground tests of Hardened Aircraft Shelter (HAS) operations at Leeuwarden’s Quick Reaction Alert stand. As part of its F-35 promotional effort, the Dutch Air Force also set up an online survey which attracted participation of 1,000 households. They were asked to listen to the F-35 flights and then say whether it is noisier than an F-16, whether the perceived noise is longer than the F-16’s, and whether vibrations were higher or lower. The poll’s results are not yet available, but Plankman said respondents said they could live with that level of noise. “That was the general opinion of the community,” he said. However, even if a single F-35 is only marginally noisier than an F-16, some residents say the total noise will be much higher because the F-35 can only use one of Leeuwarden’s two runways, as the other one is too short. This means air traffic over the villages at both ends (Jelsum and Marssum) of the main SW/NE runway will necessarily be higher than is currently the case with the F-16s, which can use both. In parallel to these tests, the Dutch Air Force and Lockheed Martin invited over 1,500 local residents, parliamentarians, industry executives, military personnel and media for briefings on the F-35. Several flights by one F-35 and two F-16s were conducted so local residents as well as guests could experience the F-35 noise footprint at first-hand. 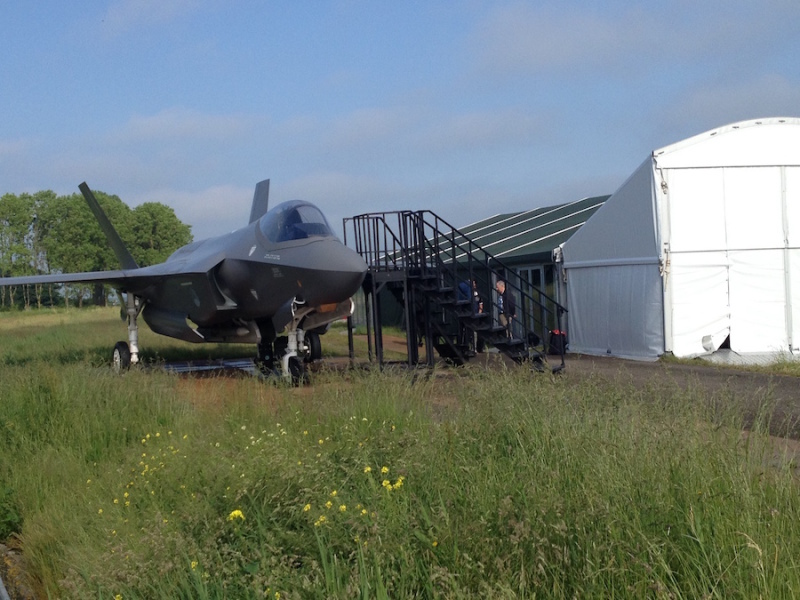 The briefings took place in a specially-erected hospitality tent on the base, where Lockheed Martin exhibited a full-scale F-35 mockup as well as a cockpit demonstrator. Lockheed sent five public relations specialists to Leeuwarden, according to Michael J. Rein, the company’s F-35 spokesman. Plankman said that the Dutch air force is financing the public relations operation, while Lockheed is paying the cost of bringing the mockup and cockpit demonstrator to the base. Asked how much the operation had cost Lockheed, Rein said in an e-mail that “Internal financial expenditures for our company are not discussed in public. I can confirm no money was charged to The Netherlands Government [or] the US F-35 program for this effort. It was all company funded.” He added that “We have no set up in Volkel,” the second Dutch air base where the F-35 will be based. The RNLAF, which currently operates a squadron of F-16s here, brought over two F-35s from Edwards Air Force Base in California and flew one of them from the base for several days to allow the Dutch National Aerospace Centre (NLR) to measure their noise footprint. Local residents were asked to listen to several overflights by F-16s and F-35s, and to evaluate their perceived noise levels. Initial measurements by the NLR showed the F-35 is about 3 decibels noisier than the F-16, a smaller margin than anticipated. The final report on the noise measurements was due to be published June 1, but is not yet available at the time of writing. Several residents interviewed by Defense-Aerospace.com say they found the noise generated by the F-35 to be deeper and lower-pitched than that of the F-16, and so less bothersome to human ears than the high-pitched F-16 “scream”. Local residents measured several overflights and landings – but apparently no take-offs – using a hand-held meter, which showed the F-35 generated 20 decibels more than the F-16 (see video above). These measurements, made at a single location, cannot be compared to NLR’s more scientific set-up, which used sensors at several locations selected by local residents’ associations, air force spokesman Planckman said. -- June 6, 2016: added video of aircraft noise measurements by residents around Leeuwarden air base.